A baby needs warmth, security, and lots of love. 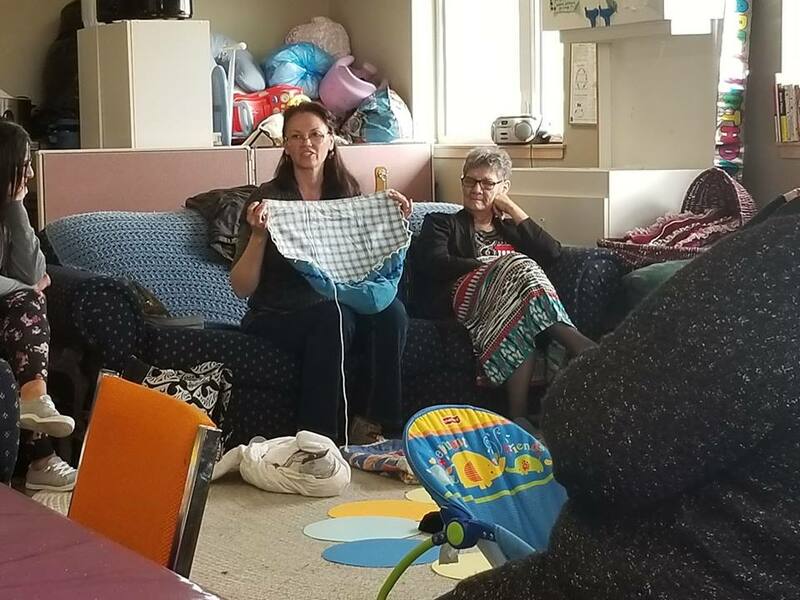 Women in Saskatoon recently had the opportunity to learn how to create a Métis moss bag to provide all of that – and more. For centuries, the moss bag has been used by Indigenous Peoples to keep a baby snugly wrapped, creating a warm, womb-like environment that makes the baby feel safe and sleep better. The top of the bag holds the head secure. Moss bags traditionally held freshly gathered sphagnum moss, known to have medicinal properties that made it an ideal diaper: antiseptic and absorbent, the moss kept the baby dry and rash-free. Leah Dorion, Métis educator and artist, describes the moss bag as “a beautiful inheritance, shared from First Nations’ women to Métis women, that provides babies with security, love and safety.” Along with her aunt, Métis elder, Elsie Sanderson, Dorion led three workshops for the Saskatoon Mothers’ Centre in the spring. “The Moss Bag is a beautiful inheritance, shared from First Nations’ women to Métis women that provides babies with security, love and safety.” ~ Leah Dorion. Jennifer Altenberg, Project Coordinator, exudes enthusiasm when she describes the successful project. Her job with the Saskatchewan Health Authority saw her working with the Saskatoon Mothers’ Centre, where she initiated “Traditional Parenting Tuesdays,” providing a welcoming space for women to drop in, share stories and coffee, and learn together. The women told Altenberg they were interested in learning traditional Métis teachings. She applied for and received funding for the Moss Bag Project from SaskCulture’s Métis Cultural Development Fund. “We created a poster to advertise the Moss Bag Project, and the response was incredible! We ended up holding three separate workshops to meet the huge response – and, at each workshop, more women arrived to participate than were registered.